A wise counselor of mine once told me that it was not as important what they’re saying in the news, as it is what they’re NOT saying. We Christians are all standing around in disbelief as one crisis after another unfolds in our government. There are so many that majorly impact Christians that we can’t even keep up with all of them! 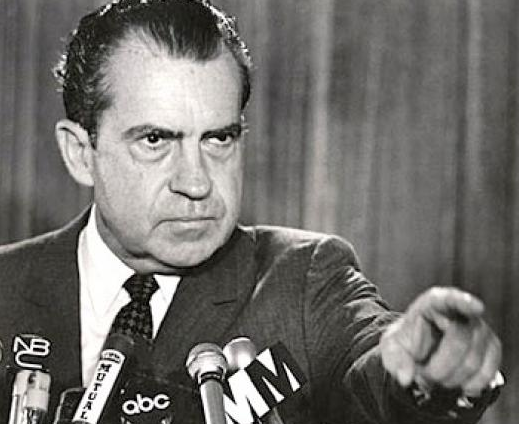 Poor Richard Nixon got canned for just trying to cover up his lying about his connection to a crime. Any one of the Obama Administration’s lies is far worse than Nixon’s. So I’m wondering what they’re really up to? What is it that they’re NOT telling us? What’s so potentially disastrous that they’re having to pummel us with crisis after crisis to keep our eyes off the real problem? What else is really going on? If they ARE trying to keep us off the mark, I think I may know what it is. Follow the dollar. We’re printing new ones at reckless abandon. So what? Most are bored to tears/heard the wolf cries before. 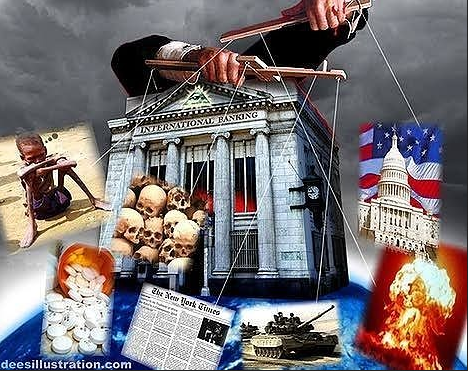 But the reality is, there are at least three financial areas that are downright scary… any one of which could take this nation down… almost overnight. 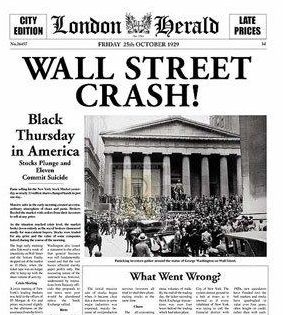 1) A stock market crash. The Dow Jones Industrial Average is 3,000 points higher than the last major correction, and at that time, the economy was in good shape. If the market tumbles, we have no wiggle-room to absorb the shock. But a massive correction will come sooner or later because the rise in prices does not reflect our true economic picture. Some believe it could easily fall 50% in six months or less. 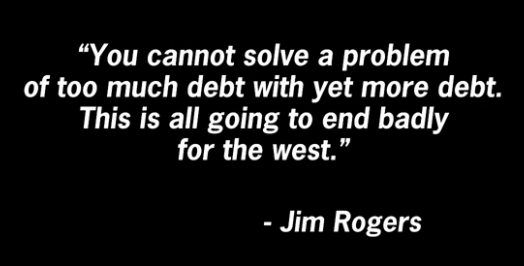 The debt is continuing to grow exponentially, and we’re now borrowing 4.5 billion dollars a day to pay our bills. But no one is talking about it any more. It’s off the news. 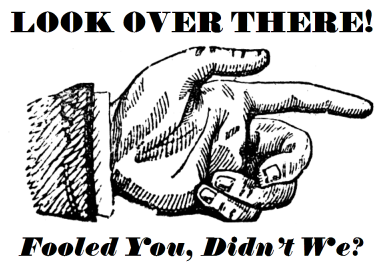 Heard anyone complaining lately about the debt ceiling or total national debt? I haven’t. Not a word in a long time. Yet it’s continuing to get worse by the day! And at every opportunity, we seem to find ways to spend even more money, yet NO ONE is talking about cutting the deficit. Do you think we can borrow our way out of debt? Is borrowing making our situation better or worse? Of course it’s making it worse. Way worse. What’s even more interesting is that even though we’ve doubled the debt in the last 6 years, we’re enjoying the lowest interest rates in the history of the country. How is that possible? Only by artificial manipulation. Imagine the rush for the exits when that cat gets out of the bag. 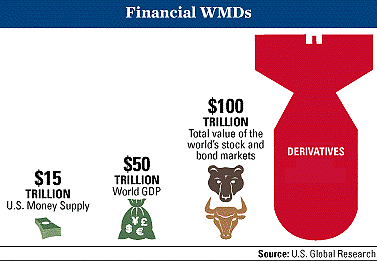 We have over one quadrillion dollars of derivatives in action (quadrillion comes after trillion). 50% more financial exposure than the entire stock market. Wondering what the heck a derivative is and/or why it matters? A derivative is a legal contract that gives you the option to purchase anything of value at a certain price in the future. Banks love derivatives. They’re like an unregulated casino where banks are making huge profits. And it’s an addictive problem. In a nutshell, our banking exposure via derivatives is twice as large as what caused our last financial disaster in 2008. Look at these banks and how much they have in derivatives contracts (actually just “bets”). Both the U.S. debt and the derivatives market cannot stand even a modest move in interest rates. If the interest rate were allowed to float without artificial restraints, the financial world would collapse. Do realize that if there is a problem, the lenders have control. And guess who owns 2/3s of America’s national debt? Foreigners. Foreigners would decide what happens to the U.S. in the event of a default. We’re not even able to appeal. In a sense, they have already won the war, we just don’t admit it yet. So we know the economy is smoke and mirrors. 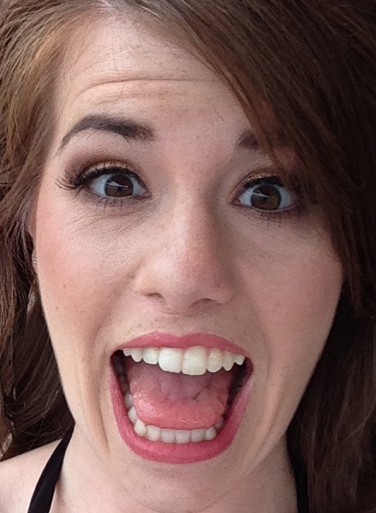 Something big is going on behind the scenes. It could be the introduction of a world currency. Or it could be, according to the most pessimistic, the designed financial implosion of the United States in order to do away with the constitution and bring it into a world government. I just don’t believe that all this is going on by accident. Even Fox News #2 owner, next to Rupert Murdoch, is an Arab billionaire–Prince Alwaleed bin Talal. Do you think he has zero input? Hardly. Recently we’ve seen that if you’re an outspoken conservative or want to exercise your “God-given rights,” you’re a target of our government. And the U.S. Department of Justice is so corrupt they won’t even investigate the charges made by Congress! 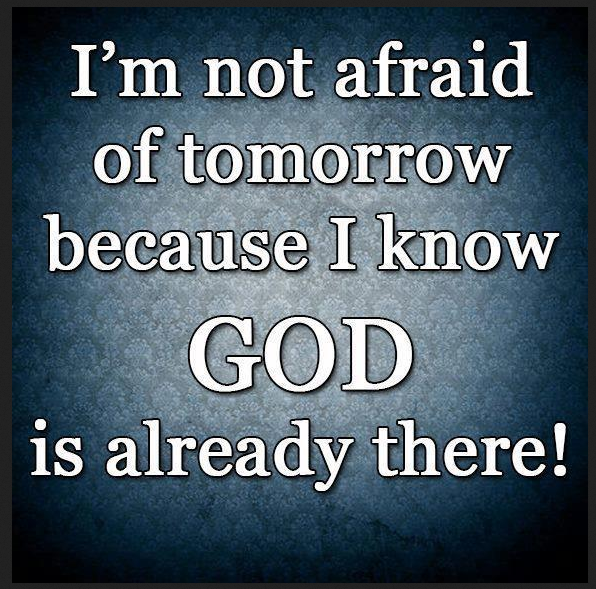 But hey, never forget that God’s in control. Nothing is happening that is surprising Him or catching Him off-guard. His agenda will prevail. On September 20th we have a speaker at our Steeling the Mind Bible Conference in Denver who will address that very issue. It’s titled “How to Know God’s Will When The World Is Crashing Around You.” Should be awesome! Make plans to join us! Details HERE.